1. Is it a crime to buy and travel on one-way air tickets? 2. Are all relatives of a terrorist considered terrorists? 3. Dr. Haneef's SIM card was not involved in any terror activity. 4. Why was his wife's visa to Australia canceled? 5. 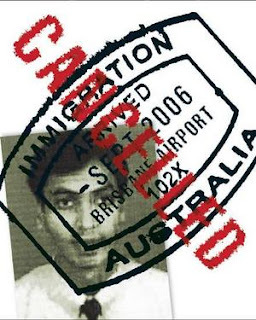 When Dr. Haneef's visa was cancelled, why was he not deported? 6. Why was Dr. Asif Ali, friend of Dr. Haneef, harassed and why is he not allowed to say what happened to him when he was under detention? Nick Bryant's piece on the Keystone cops - why the case disintegrated. Radio NZ article reports on a case heard in Lautoka High Court, which dismissed an application to have the Fiji Independent Commission Against Corruption declared illegal. This particular case also represents a significant boost to the mandate of the clean-up campaign, undertaken by the Interim Fiji Government, which found massive irregularities in Native Institutions. These discrepancies, could find the deposed Prime Minister of Fiji, Laisenia Qarase culpable for abuse of office. Earlier, Qarase had denied abusing his position to enrich himself or cordoning corrupt practices under his watch. 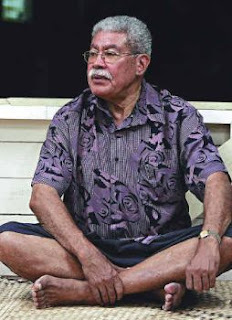 Qarase counter accused the Corruption Unit of selectivity, by steering the investigations clear of the Fiji President, who was also appointed as President of Native Lands Trust Board, while Qarase chaired the board. Qarase's accusations, actually acknowledges that, the crime(s) took place. It was during this time, approval of several questionable projects involving Pacific Connex and the illegal de-registering of native land without consent or approval of the native land owning units occurred. Other case that may involve Qarase includes the projects at Natadola and Yaqara; both locations of proposed major development projects, without the ownership and approval of the landowners. These projects placed NLTB and Fijian institutions under scrutiny following complaints, involving coercion, misrepresentation and transactions under false pretences. organisation involved in the recent UK attempted car bombings. was found in the car that was driven into Glasgow airport. Sabeel Ahmed was arrested in Liverpool. the counter-terrorism legislation last year. the grace of God go I". "[It was] every Muslim's fear that this could happen to him," he said. something happens a year later. back, these are not unusual things." Greg Ansley in the NZ Herald wrote about the red faces over the collapse of "evidence" against Haneef. 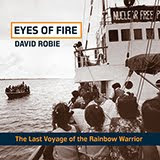 Things are tough in East Timor - courage is the name of the game. The risks are great and the pay meagre. And there are few institutional checks and balances - no media councils, the journalist unions (two of them are struggling) and the threats and assaults many. In spite of this, the Timorese journos and media did a tremendous job during the recent presidential and parliamentary elections - better in many respects than what is done by the NZ and Oz media! 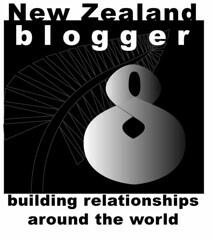 The NZ media mission last month did a great job there monitoring the media's role. 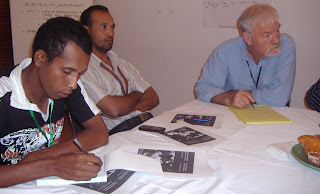 (I was part of that effort - I'm pictured by Walter Zweifel in a workshop with a couple of Dili journos). The report came up with a host of ideas and recommendations for strengthening the media in future. Scoop picked up on the report - but it seems to have dipped below the horizon in most media, apart from Clive Lind in the Dominion Post and Judy McGregor, mission leader, in an interview with Colin Peacock on Timor's fledgling media in RNZ's MediaWatch. "New Zealand's media faces a crisis. Newsrooms are being cut, journalists' wages and conditions are under attack and commercial pressures are seeing news quality sacrificed to improve corporate profits. This isn't good enough - a well resourced news media is vital to the functioning of good communities and a healthy democracy. Without quality journalism, good technical support and decent media resourcing New Zealanders will not get quality and reliable news and that means the crucial decisions we make in our lives as citizens risk being uninformed decisions. Help stop the decline of our media and our democracy by joining our campaign to take our media back." Registration has opened for the Journalism Matters Summit (August 11-12) - run by journos for journos. Programme under comments. "Fiji has [had] 4 coups in 20 years and probably a milestone [millstone?] 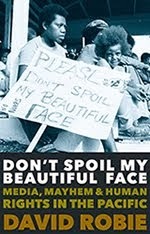 in the maturation of Fiji's democracy." Alleged misinformation and media bias are among LF's pet hates. It is ironic that when I was a student, universities prided themselves on being places where police intrusions would be resisted. In these days of creeping authoritarianism and securitisation, this is clearly no longer the case. The reports that a range of state authorised investigation bodies might be given access to information on request will alarm many academics and students. This issue needs to be discussed at the Faculty level ... However, this issue is of particular relevance to all those linked with forms of professional practice that involve confidential relationships. I will take Journalism as an example but lawyers,nurses, doctors, social workers and others will have similar concerns. Journalists have a ethical obligation not to reveal confidential sources. Journalists in the workplace rely on their employers to resist attempts to seek confidential information. Prudence of course means that Journalists use coded names, hide documents and are careful in all communications. Even if an interview is on the record for the purposes of publication however, a journalist does not usually or willingly allow that to be used for purposes of prosecution. We are journalists not arms of the state. I would argue that the university should actively protect the independence of staff and students. In the meantime, we should consider all the practical ramifications of this situation. We already advise our students against recording the names of confidential sources and we will now reinforce that they should take extreme care with communications they conduct using UTS email and with the storage of digital and other material. One of the dangers is that practices can become normalised. For example, I believe it is likely that part of the purpose of holding Dr Haneef so long is to establish a base line for detention in future cases. This is why some actions need to resisted on the basis of principle. Louise Williams, of the SMH, who recently spoke at the Pacific Media Centre, took a sideswipe at the Australian ignorance of Asia in an interesting piece in her newspaper (she must have filed from NZ): "The first step towards solving a problem is admitting you have one. But, what's not so useful is getting stuck standing up the front, confessing your weaknesses over and over again. In the case of Australians' [... read Kiwi] scant knowledge of Asia, we've had decades of tut-tutting committees and urgent recommendations, but too little to show for them." Her advice to journo graduates wanting to report on the Asia-Pacific region is in the Global Watch section on the PMC website. More on the Singapore WJEC debate: AJR editor Ian Richards points out in an ongoing JEA debate that the Singapore declaration preamble refers to "the effective and responsible practice of journalism", states that journalism "should serve the public in many important ways", and states that "above all, to be a responsible journalist must involve an informed ethical commitment to the public". He believes it's much better to approach the issue this way and so lay a foundation for dialogue and communication with others in our field around the globe than to have no foundation at all, which would be the case if no allowance was made for "political reality". 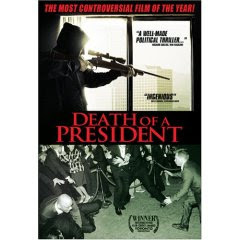 Bland and descriptive - and free speech? "I recall saying from the podium in Singapore, I thought the WJEC declaration was bland and descriptive. I also wondered why there was no reference to freedom of speech or the Declaration of Human Rights. "Just for the record, the journalism education declaration was formulated by the WJEC which is a completely separate organisation from AMIC which in this case merely hosted the conference." Just to add my few words, I tend to dismiss the recent negatives about "development journalism" - it is often misunderstood by western journos, particularly from Oz and NZ (most NZ j-schools cover little about news values outside the Kiwi environment). Vigorous development journalism as often practised in the Philippines and the Pacific, for example, uncovers corruption, is committed to media freedom and demands accountability - and usually requires a level of personal courage from journalists rarely needed in western media environments. Alan noted the closing day speech by Anwar Ibrahim - this was inspired, even brilliant. It was worth being at this conference to hear him! Certainly he was one of the highlights for me. Check out Digital Learning for the UNESCO booklet launch at AMIC and Guy Berger's Conversant blog and WJEC for the other "models". 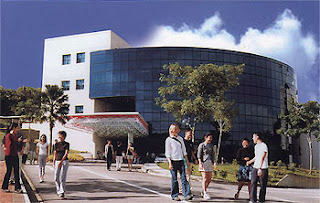 One of the highlights for me at the AMIC conference in Singapore last month - where I gave a paper offering a critique of international media aid in the Pacific and was reelected as the NZ country rep - was a visit to Nanyang Technological University (pictured), which has one of the best communication studies and journalism programmes in Asia (Wee Kim Wee). "I hope this WJEC thing doesn't over take the domestic JEA agenda and meetings etc...one thing that Singapore told me was that the universality of journalism and journalism education is a bit of a pipe dream, and extremely dangerous, and could easily lead to the imposition by the strongest on the rest, colluding with globalism and journalistic imperialism at the expense of localised journalism and journalism education fit for local purpose rather than adhering to some kind of universal ( inevitably Western) approach....we need to keep focused on the internal Australia problems, which are very important ones to solve at the moment, particularly the RQF matter which needs the biggest guns in the university journalism schools to be involved, the professors and senior highly thought of journalism educators need to be at the spearhead of this discussion...."
Fretilin's post-election woes are given a good airing in Damien Kingsbury's Melbourne Age piece about how Timor is embracing democracy in spite of the impoverished country's strife. What now for Alkatiri? Ranjit Singh has taken another potshot at NZ hypocrisy over "democracy" and Fiji. And Jason Brown has a barbed dig at media freedom awards and back-scratching. But for those seriously contemplating the poor state of Asia-Pacific regional reporting, Louise Williams has a few sobering comments with this account of how she got started. 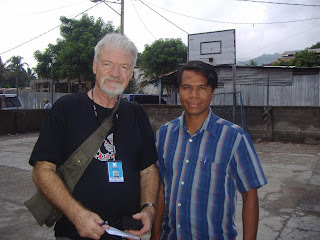 Interpreter Zef and me ... we're on a basketball court near Fretilin's HQ during the recent Timor-Leste parliamentary election campaign. We were on a novel mission to report on the national and community media's participation and contribution to free and fair elections. Fairly remarkable stuff, especially considering the lack of available media resources. A huge challenge indeed. Thanks to Walter Zweifel for the pic. If you would like to take a peek at our end-of-mission communique, go to this link at the Pacific Media Centre. The full report should be a public document very soon.